After hearing about huge quantity and variety of new results all week at the Moriond conference, we were finally treated this morning to the bigger picture. Roman Kogler, an experimentalist speaking on behalf of the Gfitter group (a small group of experimentalists and theorists) showed how the Standard Model gives a coherent picture of particle physics as we know it today. The equations of the Standard Model contain several closely correlated parameters. The Gfitter team collected the best theoretical calculations performed by theorists to-date and injected in the equations the various parameters determined experimentally. These are quantities such as the masses of various particles (top quark, W and Z bosons masses) and several couplings (parameters related to how often a particle will decay into lighter ones). This technique is called an “electroweak fit” as it refers to making a global fit to all the parameters of the electroweak theory. 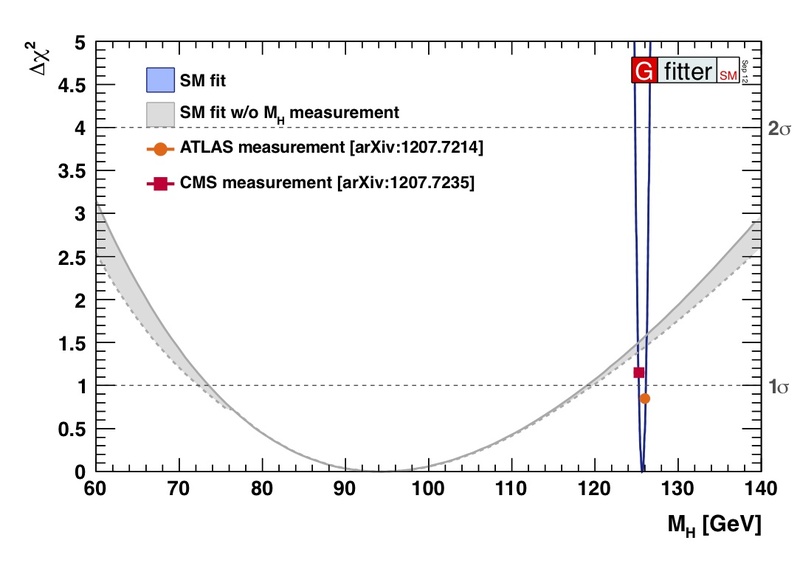 Such fits were used to predict the mass of the top quark before it was even discovered at Fermilab in 1995 as shown on the plot below. The predictions made on the mass of the top quark using a simultaneous fit to all the parameters of the electroweak theory. 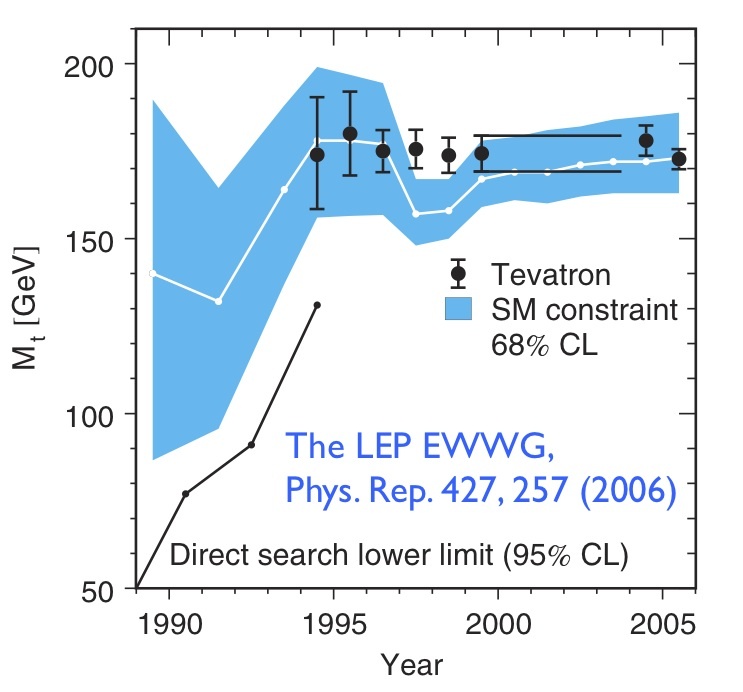 The blue band represents the predictions obtained form this fit whereas the black points show the experimental value measured by the Tevatron experiments from Fermilab. The agreement between the prediction and the actual measurement, as seen on the above plot for the mass of the top quark, is remarkable. As the measurements of several parameters used in the fit became more precise over the years, so did the predicted value coming out of the fit to eventually agree very nicely. One new and essential parameter of the electroweak theory is the mass of the Higgs boson. For many years, one important outcome of these global fitting procedures was a prediction of what this mass could be, guiding experimentalists in their search. We can now play two different tricks: use all other measured parameters and predict the mass of the Higgs boson. Or we can assume the new boson discovered last summer is the Higgs boson, and use its mass to check the model for self-consistency. We want to see if everything fits nicely together or if the model starts to burst at the seams. Both answers are shown on the following plot. The point where the wide-open grey curve touches the horizontal axis provides the most probable Higgs boson mass value given all the other constraints imposed on the Standard Model by all the measurements injected into the equations. The width of this curve gives the uncertainty on the mass prediction. The answer is 94 plus 25 or minus 22 GeV, in agreement (within 1.3 times the uncertainty on the measurement or 1.3 sigma) with the mass of the new boson which is now roughly 125.7 ± 0.6 GeV. Adding 1.3 times the uncertainty of the fit (25 GeV) to the value found (95 GeV) bridges the gap between the predicted and measured values. So the fit makes a prediction consistent with for the mass of the new boson. The second curve, the narrow blue curve, shows the prediction of the fit if you inject the experimental value of the new boson mass into the fit. If the theory has internal consistency, the returned value from the fit should agree with the injected value for the Higgs boson mass. And it does, with a much reduced uncertainty margin, falling pretty much on top of the injected value. This means that the electroweak part of the Standard Model has great self-consistency. As it stands, there is only a 7% chance it could be in worse agreement. The difference comes mostly from two parameters used in the fit, namely the mass of the W boson and the so-called left-right asymmetry parameter measured in Z boson decays to b quarks. By further reducing the uncertainties on the input parameters used for the fit, we will eventually see if the Standard Model gets in trouble. But as it stands, all is good although it has less and less leeway. This means such fits may eventually reveal flaws in the model.